Acquisition History: The property was acquired by fee simple through the LCIP in 1993. Description: Situated on the easterly side of Route 4A, the property includes over 70 acres of meadowland that begins on the Route 4A plain and rises up in a series of benches to a 1,100-foot elevation. 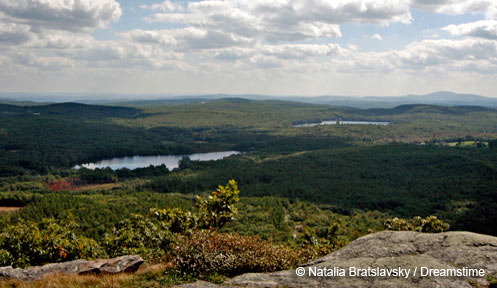 The upper fields provide spectacular views of Mascoma Lake and valley, as well as providing important edge habitat for a variety of upland game. Over 1,000 acres of woodland surround the Route 4A fields. An expansive network of trails extend through the forested portion of the property. Examples of Shaker stonework are found throughout the woodland in many stonewalls and a set of canals that collected water for powering the stone mill located on Route 4A. Apple trees occupy some of the fields. There is an active sugarbush (stand of maple sugar trees for sapping). Habitat projects take place on this property to enhance early successional habitat, and rehabilitate soft mast-bearing trees on field edges. These projects are funded in part by the Wildlife Habitat Incentive Program (WHIP) through the USDA Natural Resources Conservation Service. Common Wildlife: Upland species include all big game and small game, as well as various songbirds. The Mascoma chapter of the Audubon Society of New Hampshire maintain a bluebird box program. The fields are all managed for grassland wildlife such as bobolinks and meadowlarks. Special Notes: This area is just north of the 3,000-acre Henry Laramie WMA. Located on the mid-level meadow is the Shaker feastgrounds, a one-acre parcel delineated by apple trees and granite. This area provided a secluded location for Shaker spiritual gatherings. Directions: Route 4A, across from Mascoma Lake and the Museum at Lower Shaker Village.